Congratulations to the winners of the last contest. Avery Aames' The Long Quiche Goodbye will go to Mildred B. from Great Neck, NY. Raelena P. from Portsmouth, VA won Chris Cavender's Pepperoni Pizza Can Be Murder. The books will go out in the mail tomorrow. My husband, Jim, loved suspense and thrillers. So, this week, I'm giving away the kind of books he liked, beginning with a book by his favorite author, Lee Child. I have an unusual number of copies of Child's Gone Tomorrow. Two winners will definitely receive copies. But, if someone has a great reason to want this book, I might send out another copy or two. Gone Tomorrow is the thirteenth book in the Jack Reacher series. There's a terrific introduction from Child, saying this book is a "product of the internet age." It's a story of terrorism, opening with a bang when Reacher suspects he's sitting in a subway train with a suicide bomber. Should I say it's an "explosive" novel? 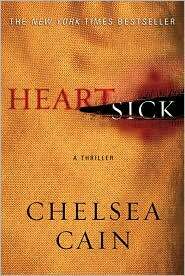 Heartsick was the book in which Chelsea Cain introduced Gretchen Lowell, the beautiful serial killer who was tracked for years by Portland detective ARchie Sheridan. After Gretchen caught him, and tortured him, she let him go. He's a damaged man, but has to pull himself together to catch another killer. It's too bad he has to reach out to Gretchen for help. Heartsick is now being released in trade paperback, and I have a copy to give away. Would you like to win Gone Tomorrow or Heartsick? You can enter to win both, but I need separate entries. Email me at lholstine@yahoo.com. Your subject line should read either "Win Gone Tomorrow" or "Win Heartsick." Your message should include your mailing address. Entrants only in the U.S., please. The contest will end Thursday, Sept. 23 at 6 p.m. PT. The winners will be selected by random number generator. I'll notify the winners and mail the books the next day. Good luck! Thanks for the note, Kathy!